Join us at the PDF Center for Peace and Justice on October 4th to meet PDF’s board of directors and grantees. Parking is available on North Prospect Street after 5 p.m. or behind CVS. CPASGhana is a community based, nonprofit organization dedicated to catalyzing development and empowering young women and girls. Located in Nsawam, Ghana, they focus on local capacity building through economic development, education and health services while supporting and protecting local culture and the environment. They strive to create a thriving local economy where education, health care, economic development, clean water, housing and renewable energy are available to all. 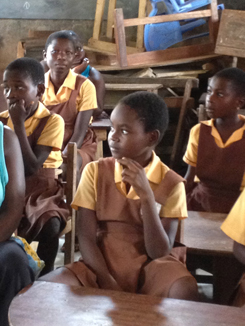 In 2011 CPASGhana began by making small loans to a select group of women. In 2012 they expanded their work to include the School Girl Sponsorship Program, an effort to keep girls in school who are at risk of dropping out or who are taken out to work. Nsawam is located in the Eastern Region of Ghana, 37 km from the capital Accra. It is an agricultural community of 120,000 and the largest town and marketplace for the area. This community has the potential to be an example of successful, sustainable development because of its agriculture and regional market. People are engaged in small businesses such as farming, selling foodstuffs, bread baking, various trades and small-scale food processing. With the ability to access education and training, community members will be able to improve their standard of living for themselves and their children. Come hear more about CPASGhana at our PeaceTalk on October 4th.